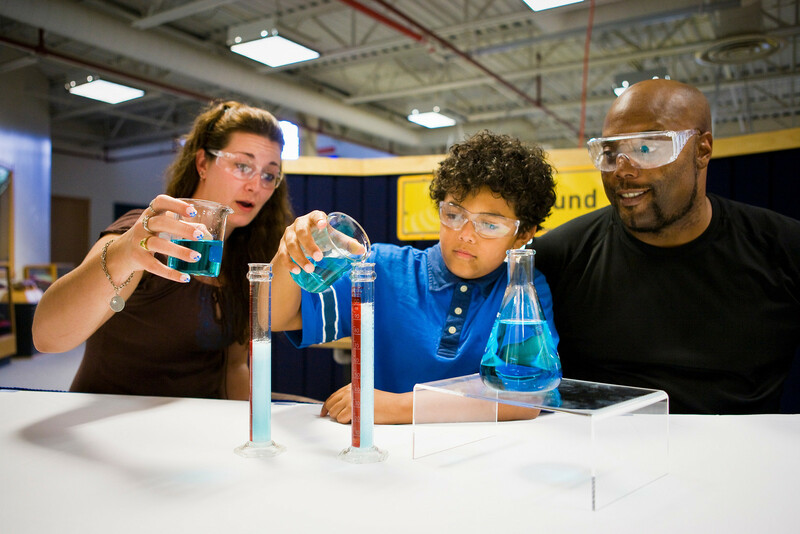 Around the world, science centers, universities and community organizations are exploring new facilitated experiences for engaging adults and older youth in conversations about the societal implications of science and technology. These facilitated experiences help foster public engagement of science through conversations and interactions with scientists, and allow both educators and scientists to adjust the science content, pace, and delivery style to suit their audience. 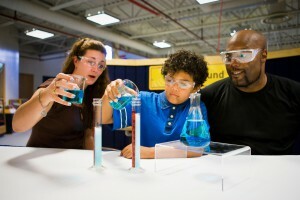 For the last 10 years, the Nanoscale Informal Science Education Network (NISE Net) has researched, developed, and tested a variety of these facilitated experiences and shared them with the science museum community to build our capacity to engage the public in this kind of programming. Over the course of the next few months I will be writing a series of four blog posts about some of the programs, activities and professional development tools that the NISE Net has developed and will share some ideas on how you can adapt them for your own teen science café. I’ll share a selection of our forum programs, role-playing activities, hands-on activities and then finally I’ll share an approach to evaluating your teen science café. But first, let me share with you a little more about the NISE Net and what we have to offer. 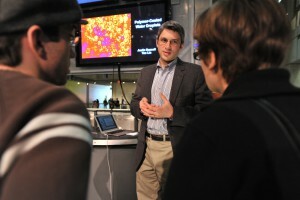 The NISE Net is a national community of researchers and informal science educators dedicated to fostering public awareness, engagement, and understanding of nanoscale science, engineering, and technology through the development and dissemination of programs, exhibits and professional development resources. The NISE Net maintains a website featuring a digital library of public nano educational products and tools designed for use in informal education settings. It features a variety of educational programs and activities, media, exhibits, professional development tools, and evaluation and research reports designed for educators and scientists. All products on the website created by the NISE Network were developed through a process of prototyping, audience evaluation, educator peer review, and in-depth partnerships with scientists. Our programs are fully documented, with complete lesson plans or activity guides, presentation materials, and other training and delivery tools and are available for free digital download. We designed them to be easily adapted and modified for different formats and audiences under a Creative Commons attribution non-commercial share-alike license. 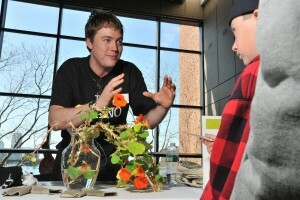 To learn more about all of our programs and the NISE Net visit www.nisenet.org. Today’s blog will focus on forums. Our forum programs encourage audiences to consider the societal and ethical implications of science and technology topics. Older youth and adults participate in one- to two-hour facilitated discussions that promote scientific exploration and foster dialogue and deliberation. They can take place in a variety of contexts and locations, including science museums, libraries, community centers, schools and now, hopefully, teen science cafés. Teens discussing implications of nano-technology on every day life. Each forum is typically divided into two parts. The first half usually involves two 15 to 30-minute presentations, one from a scientist/expert introducing the science behind the topic, followed by a social scientist sharing the potential societal and ethical implications. The second half of the forum focuses on the participants engaging in facilitated conversations or role-playing activities with the experts. These conversations usually take place at individual tables throughout the room with both scientists/experts moving from table to table throughout the second half. The forums typically end with a 15-minute whole group discussion/wrap-up where each table reports out on what they discussed. Below is a list of our most popular forum programs that may be suitable for a teen audience. Each program will contain a written guide and all necessary materials and background information to carry out the program on your own. For more detailed information on creating public conversations through forums you may also want to check out our Forums Guide. And should you have any further questions about forums, how to adapt them to your audiences, finding the best presenters, etc., don’t hesitate to reach out, I’m more than happy to help! For now, take a look at these resources and post any comments, questions or ideas you have for using them in a teen science café in the comments section. Let’s explore these together! Privacy. Civil Liberties. Nanotechnology. : Every time we use a credit card, swipe a subway pass, or send an email we are sharing personal information about ourselves. Just how is the information used? How do we balance an individual’s right to privacy vs. community safety? What do you consider a civil liberty? And who ultimately sets these standards? This forum asks participants to consider and discuss several nanotechnology application scenarios and the possible opportunities, impacts, risks, and benefits. Nanomedicine in Healthcare : This forum explores nanotechnology-enabled medical technologies and their potential to transform health care, while considering the societal, ethical, environmental and economic impacts of this emerging technology. Energy Challenges, Nanotech Solutions : This forum places participants in the role of a governmental funding agency and asks them to consider how nanotechnology should fit into the timeline and scope of future national energy policy. Risks, Benefits and Who Decides? : This forum asks participants to discuss the strengths and weaknesses of three options. They will also have the opportunity to raise questions about the societal and environmental implications of nanotechnology to a panel of experts. Scientist Speed Dating : Scientist Speed Dating is a facilitated, yet informal and high-energy, social activity to encourage a large group of people to speak with one another, ask questions, and learn about specific areas of research and practice within the field of nanoscale science and engineering, as well as the related societal and ethical implications of work in this field. Same Sides and Let’s Talk About It Plays : This 50-minute program includes an introduction to the nanoscale science, conversation time for the participants and 2 ten-minute plays that stimulate conversation about the impact the field of nanoscale science may have on our lives. It also gets the audience thinking about how we should respond — both individually and collectively — to those potential impacts. 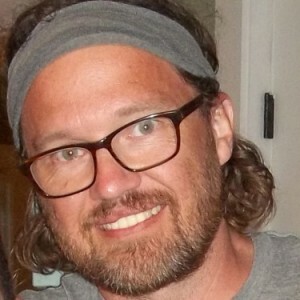 Brad Herring is the Director of Nanoscale Informal Science Education for NISENet and Multimedia Content Developer at the Museum of Life and Science in Durham, North Carolina. Brad has worked in various capacities within the Network for the past 8 years including Network-wide administration, overseeing program and multimedia development, creating and delivering national professional development workshops, managing the Southeast Hub for the Network, and developing strategies to engage inclusive audiences.